Excellent service, delivered exactly on time, totally satisfied and will purchase from here again. 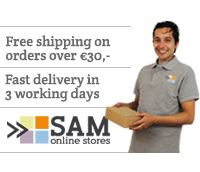 Could not recommend SAM online stores highly enough. With a projector bracket you can easily adjust the position of your projector. We offer two types of mounting: ceiling and wall mounting. Our projector brackets are compatible with all brands and types. Ceiling mounted brackets are the most common choice for regular videoprojectors. First you calculate the ideal projection distance for your projector and projection screen. Then you secure the bracket to the ceiling. And finally you mount the projector. When you are done, the projector position can easily be fine-tuned by hand. Wall brackets are mostly used in combination with short throw projectors. These projectors can be placed at a close distance to the screen whilst covering the complete projection surface with images. Short throw projectors can be mounted as close as 60 cm from the projection surface and are often used in combination with (interactive) projection whiteboards. A wall bracket lets you mount such a projector right above the projection surface.